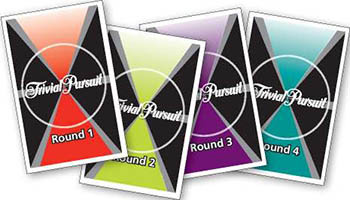 Trivial Pursuit Team is played in four rounds. During each round of play, six question cards will be dealt face down alongside the board. Teams take turns choosing a question card, answering and trying to score as many points as possible. The team with the most points, once all question cards have been played, wins. Move the farthest along the path by earning points for answering questions correctly. Set out the gameboard and place the two movers on the START space. Choose a deck of cards and unwrap it. Be sure NOT to shuffle the cards - it's important that they stay in order. Remove the rules card (the top one) and the scorecard (the bottom one) and place them on the table for reference. 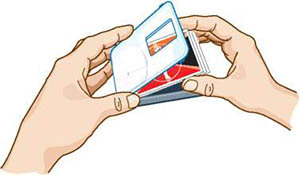 Place the cards face down in the card holder. Note: To open the card holder, locate the small bumps on the side and pop the lid up. Divide up into two teams. Draw the first card and read it aloud. It contains the rules for Round One. Draw the next six cards and place them face down on the table. The team going first selects a card from the table and the opposing team reads it to them. If your team is successful, move ahead the number of points you earned. Place the card in a discard pile. Now it's the next team's turn. Repeat for Rounds Two through Four until the card holder is empty. There are 12 card packs in the game; each one a complete game. 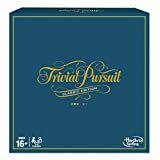 These general knowledge packs are comprised of 30 cards: a rules card, a scorecard, 4 cards that divide play into rounds and 24 question cards.The team that is farthest along the path after the last question in Round Four is played is the winner. There are four Round Cards per game. These determine which team starts play for the upcoming round and may even offer a chance to earn extra points. 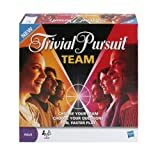 Each question falls into one of the 6 classic Trivial Pursuit categories: People & Places, Entertainment, History, Arts & Literature, Science & Nature and Sports & Leisure. Each card also has a subcategory which is based on the subject matter of the question itself. 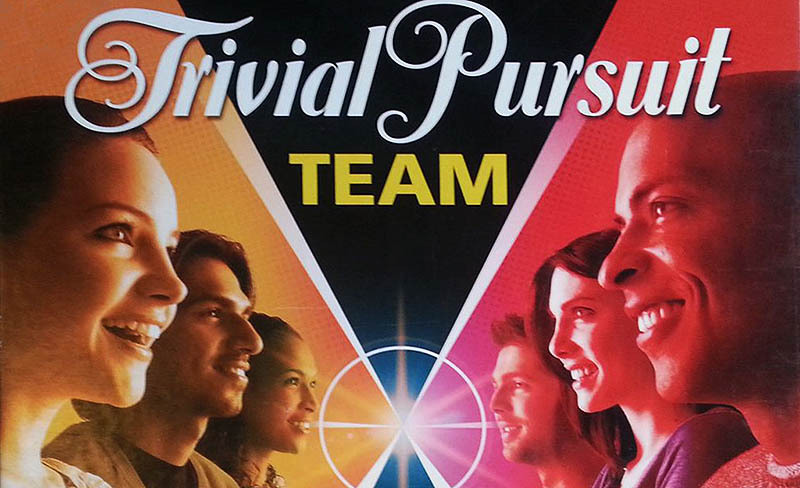 There are 24 questions in each game (6 in each round), but they aren't just standard Q&A. 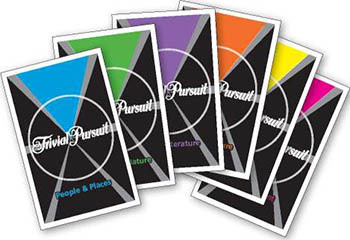 In Trivial Pursuit Team, there are 6 styles of questions to answer and different ways to score points as well. Choose the correct answer from the four possibilities provided. Given the category on the back of the card, is one player on your team the expert? If so, let that player go for it by answering the question solo. Given the connection, answer three questions that share it. Scoring: Each Answer 2 Points. Name 6 things from the given category. You only get six guesses, but you don't lose points for incorrect answers. Scoring: Each Answer 1 Point. Choose to answer either an easy or hard question. Given five questions, decide whether or not the answer is true or false. Each time you answer correctly, you can choose to either stop and keep your points or risk your points by answering another question. If you miss a question, you lose all of your points for this turn, and the turn is over. You can also play TP Team when you are out and about. Load up one deck of cards into the card holder and you have a game you can play anywhere. Each deck includes a scoring card so you won't need to take the board with you. 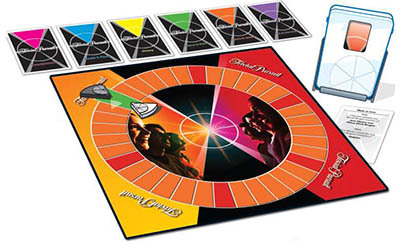 The team that is farthest along the path after the final card is played wins. You'll find 30 blank cards in your game. 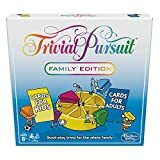 Use them to create your very own questions - stump your friends, challenge your family - make the game your own!